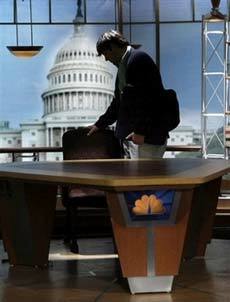 I was shocked and saddened to learn of Tim Russert’s sudden death on Friday afternoon. As you can see from my bio, I am an avid Meet the Press viewer. I had a tremendous amount of respect for Tim and his preparation, tenacity, professionalism and true love of all things political. Throughout the weekend I watched many of his colleagues, interviewees, friends and loved ones discuss Tim’s career and life. I was moved by the tribute paid to him on Sunday morning when Tim Brokaw hosted a forum to remember and celebrate Tim’s 17 years on Meet the Press. What I think helped in my own grieving process was being able to read the blogs and message boards on various news sites and learn what other fans of Tim were going through. I found that so many people respected Tim for how he lived his life, remembered where he came from and appreciated the responsibility that came with his position. The image of Tim’s son, Luke, standing over his father’s chair reminds us all that life is a gift to be treasured. In an interview with the Today show, Luke showed us that he was, in fact, Tim’s best work. Tim, you will be missed.